Like the beautiful sun it’s named after - which so selflessly shares its light with the world - this stunning crystal suggests you may find yourself feeling very drained by a friend or loved one’s needy behaviour this week. Late-night calls from colleagues and friends may leave you feeling very frustrated, and you may find yourself feeling very nostalgic too. Keep your spirits high - and wave your sadness goodbye - by keeping a Sunstone nearby, or holding one by your heart. Known as a stone of love, this enchanting crystal suggests you may find yourself attracting some very flattering - and totally unexpected - attention this week. Kind compliments from new colleagues and random strangers may leave you feeling really uplifted, and there could be an instant connection between you and a new person around you too. Boost your confidence and positivity by placing a Morganite under your pillow, or simply keeping one with you each day. Synonymous with change and new beginnings, this mesmerising crystal suggests there could be some exciting news about an unexpected pregnancy, proposal or birth this week. Heartwarming messages from childhood friends, distant family members and old colleagues could leave you feeling slightly emotional, and you may need to make a very important decision about a relationship or job too. Surround yourself with positive energy by keeping a Labradorite in your home or work place. 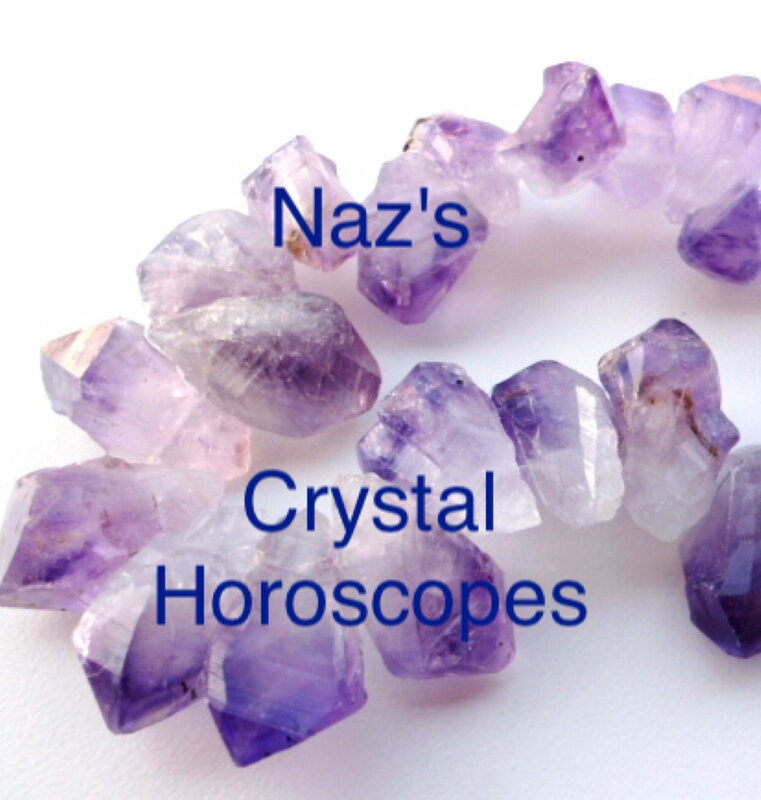 Combining the powerful properties of two of the world’s most beautiful crystals - Amethyst and Citrine - this mesmerising crystal suggests you may find yourself clashing with a very competitive individual around you this week. Heated exchanges - and tense conversations - between you and a friend, colleague or family member may leave you feeling very angry, and you may need to reach out to someone you trust and respect for their help and support too. Prized for centuries, this spellbinding crystal suggests you may need to be very careful about what you say around a very two-faced person you know this week. Snake-y behaviour from friends, colleagues and family members may leave you feeling very betrayed, and you may need to give someone a piece of your mind too! Prevent their bad vibes and negativity from draining your energy by keeping a Moonstone in your home or work place. Like this beautiful crystal - which is so often mistaken for gold - this enchanting crystal suggests you may find yourself questioning a friend, partner or loved one’s honesty this week. Secretive behaviour from new friends and potential love interests may leave you feeling very confused, and someone could surprise you with a very shocking revelation too! Leave their bad vibes and negative energy behind by keeping a Pyrite in your home or work place. Symbolising confidence and courage, this stunning crystal suggests a friend, colleague or loved one could surprise you with their jealous behaviour this week. Rude or arrogant behaviour from friends and family members may leave you feeling very hurt, and you may need to distance yourself from a very toxic friendship too. Fill your heart with love and positivity by placing a Carnelian in your home or work place, or simply keeping one with you each day. Bewitching the world with its powerful properties for centuries, this beautiful crystal suggests someone very special from the past may re-enter your life this week. Unexpected messages from ex-partners and childhood friends may leave you feeling slightly tearful, and there could be a fiery exchange between you and a friend too. Keep your confidence high by keeping a Hematite in your home, or simply holding one by your heart for a few minutes each night. Thought to gently calm our hearts and minds, this captivating crystal suggests you may find yourself feeling slightly low this week. Thoughtless comments from friends, colleagues and family members may leave you feeling very unsettled, and there could be a misunderstanding between you and a friend or partner too. Wash away your worries and sadness by placing a Blue Goldstone under your pillow, or simply keeping one with you each day. Symbolising happiness and abundance, this stunning crystal suggests you may find yourself feeling very positive about the future this week. Inspiring conversations with friends and loved ones may leave you feeling very empowered, and there could be an exciting opportunity for you to boost your bank balance too! Celebrate all the luck and happiness around you by keeping a Citrine in your purse, or simply placing one beside some money. This bewitching crystal is thought to help with everything - from improving your luck and handwriting, to preventing your pets from misbehaving and fighting! Synonymous with luck and good fortune, it's pretty much the equivalent of a lucky horseshoe, penny and shooting star in a crystal, and suggests you may find yourself feeling luckier than a four leaf clover this week! Promotions, pay rises and unexpected prizes can all be expected, and someone could surprise you with a very generous gift too. Known as a stone of love, healing and recovery, this mesmerising crystal suggests you may find yourself feeling very ‘motherly’ towards someone around you this week. Heartbreaking messages from friends and family members may leave you feeling very emotional, and the bond between you and a friend, colleague or partner could become much stronger too. Nurture the love around you by holding a Rose Quartz by your heart, or keeping one under your pillow.